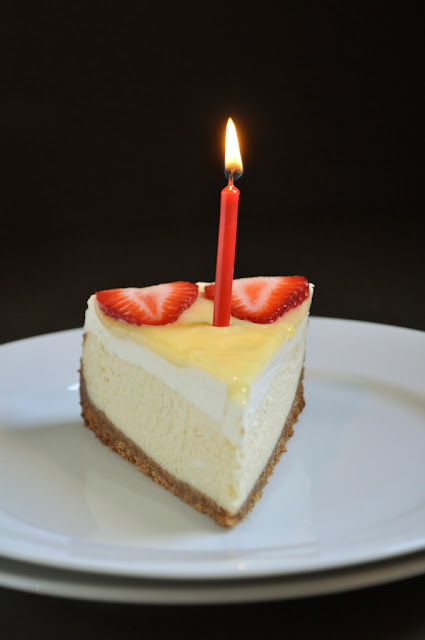 The Ginger Snap Girl: The Ginger Snap Girl Celebrates 2 Years with Cheesecake! The Ginger Snap Girl Celebrates 2 Years with Cheesecake! Two years ago today I stumbled into the blogging world. Back then I didn't know where blogging would take me or how it would become such a huge part of my life. I still don't know exactly where blogging will take me, but I do know that I love every minute of what goes into The Ginger Snap Girl. a connection to great online friends. always finding a new adventure in the kitchen. a keeper of my thoughts. part of a wonderful community. making my pants hard to button. an excuse to make ridiculously decadent desserts (a difficult sacrifice me and my skinny jeans make for my readers!). The last two years have sped by faster than I care to admit. Though this blog has been a wonderful documentation of stories and recipes, my real mission is to inspire you to get in the kitchen and cook or bake. The most gratifying part of the blog is hearing that someone has made something I posted about. It doesn't always turn out perfect. But it strikes a conversation. How can it be tweaked next time? How can you customize it suit your tastes. That's what I love. The Ginger Snap Girl has moved to her own domain name (already purchased...just need to make the leap). GSG has gotten a little makeover (nothing drastic like a face lift...but maybe a little boxtox here and there). I've challenged myself to be a better photographer and storyteller. I've lost 5 pounds and my skinny jeans fit again. I'm developing more and more of my own recipes. To celebrate two years I wanted to make something I've never made before. Cheesecake. In the realm of desserts cheesecake is not one that I typically gravitate to (plus it seemed intimidating to make). I often find cheesecake to be too rich and dense for my taste. But I had a cheesecake over the Christmas holiday that turned me into a believer! My brother's girlfriend, Lindsay, brought homemade cheesecake to Christmas Eve. When I took a bite it was light and soft and melted in my mouth. I devoured my slice in short order. Welcome to the family Lindsay! Lucky for me she was kind enough to share her family recipe with me. This recipe is easy to make so don't let cheesecake intimidate you like it did me! What is nice about it is that it doesn't require you to bake the cheesecake in a water bath. Allow yourself plenty of time to make this because the baked cake needs time to chill completely in the refrigerator which takes at least 4 hours. The base of the cheesecake is a graham cracker crust studded with finely chopped pecans (or toasted almonds in my case). 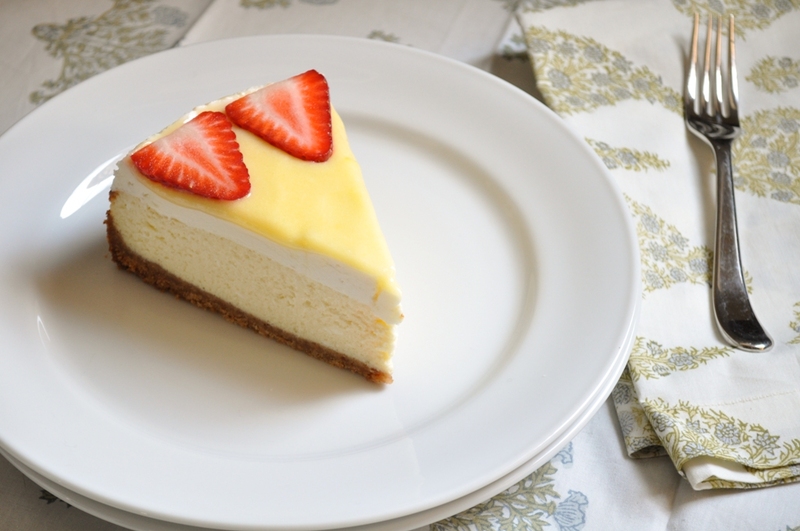 The cheesecake layer is simply cream cheese, eggs, sugar and vanilla. In the final minutes of baking a topping consisting of sour cream, sugar and vanilla, goes on over the nearly baked cheesecake and then back in the oven for an additional 5 minutes of baking (or about 8 minutes in my case). 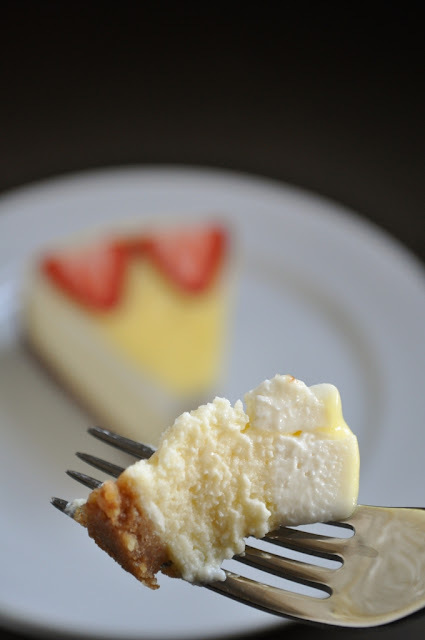 I love tartness of the sour cream layer which pairs perfectly with the light, fluffy, sweet cheesecake. 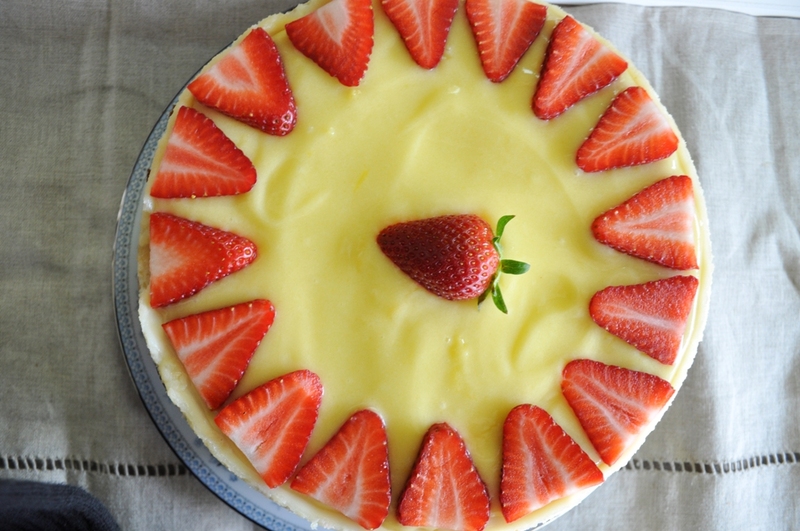 I topped my cheesecake with homemade lemon curd (link to recipe below) and fresh sliced strawberries. Pure indulgence and totally worth undoing the top button of your jeans to make room. Here's to cheesecake and another great year! Preheat oven to 350 degrees F. Line a baking sheet with parchment or foil and assemble a 9 or 10 inch spring form pan (I used a 9 inch pan). Place the spring form pan on the lined baking sheet. Start by making crust. Mix graham cracker crumbs, pecans and sugar into a medium bowl. Add melted butter and stir until well combined. Press the mixture evenly in the bottom of your spring form pan to form the crust. No need to bring the crust up the sides of the pan. Next, make the cheesecake filling. In the bowl of an electric mixer beat the cream cheese on medium for 2-3 minutes. Slowly stream in the lightly beaten eggs. Next slowly stream in the sugar and beat until fully combined, about 1 minute. Add vanilla and mix until combined. Pour cream cheese mixture on top of crust. Bake for 50-55 minutes until cheesecake is just set, but slightly wobbly in the center. About 5 minutes before the cheesecake is done baking, make the sour cream layer. Mix sour cream, sugar and vanilla in a medium bowl until fully combined. Let the mixture sit at least 3 minutes and then pour on top of the baked cheesecake and bake for an additional 5-8 minutes. The topping will appear glossy and will be just set. Once set, turn oven off and prop open the oven door using a wooden spoon. Allow cheese cake to cool in the oven for at least 20 minutes. This should prevent the top of the cheesecake from cracking. Unfortunately mine still cracked anyway! Transfer cheesecake still in the spring form pan to the refrigerator and chill for at least four hours or overnight. Do not take cheesecake out of the spring form pan until you are ready to serve it. Top the cheesecake with your favorite topping. Some ideas are fresh fruit, fruit compote, curd, chocolate ganache or caramel sauce. 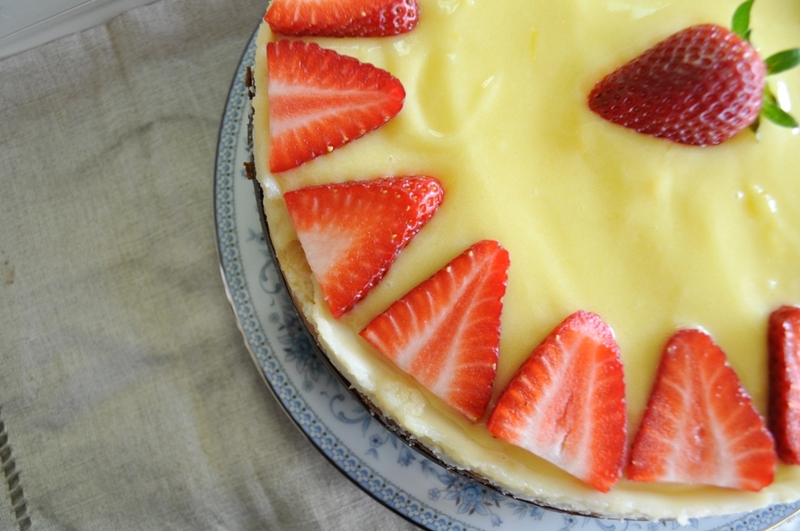 Click here for the lemon curd recipe I used to top the cheesecake. This is one stunning cheesecake, hard to believe it's your first! I always enjoy checking out your blog Gloria. Happy two years! Homemade cheesecake is one of my favorite desserts. This looks like a great recipe. I have never made lemon curd, thanks for the recipe. Lemon curd would be wonderful as a cheesecake topping. It is good to read your positive comments about blogging. It is even better to look at that yummy cheesecake. Yummy cheesecakes do make zippers harder to close. Who cares? Happy 2nd blogoversary! Cheesecake and me don't get along...that's a lie. We get along so well, that I've actually eaten an entire cheesecake in one day. That's why cheesecake is, for the most part, something I never make. That and pecan pie. Dangerous things for me. I would totally have a cheesecake attack if I made yours--it looks soooo pretty! Here's to another year, and to skinny jeans! I'm joining you in that quest! Happy 2 years! I've enjoyed reading your blog ever since discovering it 'way back when'. And this is a wonderful tribute! So beautiful! For your first time, this is truly a beautiful cheesecake. Congratulations! With all the wonderful baking you do, I can't believe you've never made cheesecake until now. It looks like it turned out great! I guess I didn't realize that we had started blogging almost at the same time! Now seems like the perfect time to tell you that I think the photographs you take of the things you make are lovely--and just keep getting better and better. Happy two year anniversary!